Feed is one of the major inputs in aquaculture production, however, the technology of feed production is the least developed sectors of aquaculture in Africa and other developing countries of the World (Gabriel et al., 2007). High cost of fish feed is one of the problems hampering aquacultural development. Expensive feeds will marginalized or even nullify the profitability of fish farming production, consequently lowering yield in terms of quality and quantity (Adikwu, 1992). Fish feed account for at least 60% of the total cost of production hence has motivated research into locally available, cheap and unconventional feeds as alternative feed stuffs for fish (Tiamiyu et al., 2013) to reduce cost of production without compromising the health of the fish. A number of plants continue to be investigated for their potential in supplementing or even replacing conventional feed stuffs. Leucaena leucocephala has been identified to be one of such plants capable of reducing feed cost as the nutritive values are right and it’s abundant in most part of the country (Jones 1979). Leucaena leucocephala is a leguminous, multipurpose tree that provides fuel wood, green manure, improves degraded lands and can be used as a cover crop. The leaves contain about 22.7% crude protein (Atawodi, et al., 2008) and survive well on degraded soils which are low in nutrients. It has bi-pinnate leaves, lanceolate leaflets and has flat pods containing small seeds. Although the leaves and seeds contain antinutritional factor known as mimosine (Francis et al., 2001) which has been reported to inhibit growth in animals (especially nonruminants), however with processing this antinutrients are easily destroyed hence improving their usability as animal feed. This study therefore seeks to determine the optimum inclusion level of Leucaena leaf meal in diets formulated for Clarias gariepinus a widely cultured fish species in West Africa. The fingerlings of Clarias gariepinus for this study were obtained from the research farm of the Fisheries Department, University of Agriculture Makurdi. The experiment which lasted for 56days was carried out in an earthen pond using hapa system. Hapas made from nets measuring 1x1x1 were mounted on a kuralon rope and set across the pond surface and properly staked to the dyke of the pond using bamboo sticks. Stones were attached to the four bottom corners of the hapas to enables the bottom surface of the hapas spread uniformly and to extend properly. The extension made easy inflow and outflow of water through each hapa system; the hapa nets were submerged half way below the water to enable easy access to the experimental fish. The feed ingredients used in the feed formulation include Fish meal, Soybean meal, Maize meal, Vitamin and Mineral premixes. They were purchased from the Makurdi Modern market and were processes and grinded into meal for storage according to the methods described by Tiamiyu et al (2014). Leucaena leaves were gotten within the premises of the University of Agriculture Makurdi, soaked for three days and sundried for another three day according to method described by Amisah, et al., (2009) by this, antinutritional factor are assumed reduced drastically. 35% crude protein diets were formulated using Pearson square method, with Leucaena leaf meal included at 0% (DT1), 5% (DT2), 10% (DT3), 15% (DT4), and 20% (DT5) (Table 1). The diets so formed were pelletized using a pelleting machine after weighing appropriately and thorough mixing of the ingredients. The fish were fed twice daily, at 5% body weight throughout the experiment and condition under an averagely constant water quality (Table 3). Water quality parameters were measured during each sampling. Temperature and dissolved oxygen was measured using multi-water parameter checker. The pH was also measured with pH meter. Proximal composition of the experimental diets and composition of experimental fish before and after the experiment were determined according to the method described by AOAC (2000). Means of data were subjected to one-way analysis of variance (ANOVA) at 5% level of significance and were significant differences were observed, means were separated using Duncan multiple range test. Table 1: Gross composition of experimental diets. Proximate analysis of experimental diet reveals that crude protein content of diet reduced significantly as the inclusion level of Leucaena leucocephala leaf meal (LLM) increased with 36.81 CP recorded in Diet 1 and 35.08 CP recorded in Diet 5 the same trend were observed for fat. Water quality measured was statistically similar and within the recommended ranges of optimum growth of the fish. Growth performance of the African catfish, Clarias gariepinus fed these diets for 8weeks (Tables 2-5) reveals that feeding with 20% inclusion level of LLM gave the best growth performance in terms of weight gain (7.64), growth rate (0.14) specific growth rate (1.249), feed conversion ratio (23.34) and Protein efficiency ratio (0.22). General growth performance may be described as increasing as the inclusion level of Leucaena leucocephala leaf meal increased (Figure 1). 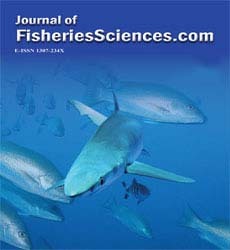 Proximate analysis of experimental fish after feeding diet with various inclusions of LLM reveals that there was significant protein retained after the study had ended with highest protein recorded in diet 5 (19.15), similarly fat was also observed to increase as the inclusions level of LLM increased. Table 2: Proximate composition of experimental diets. Table 3: Values of some water quality parameters monitored during the experiment. Table 4: Growth performance of Clarias gariepinus fingerlings fed varying inclusion levels of Leucaena leucocephala leaf meal. Table 5: Proximate composition of experimental fish before and after experiment. 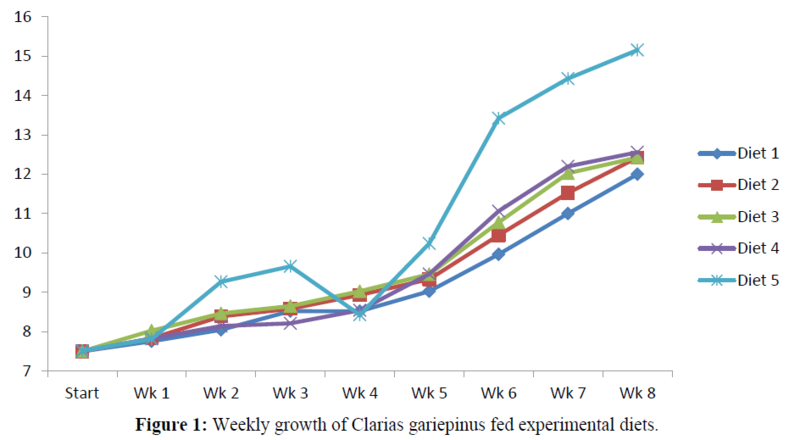 Figure 2: Weekly growth of Clarias gariepinus fed experimental diets. It is important that the alternative protein sources for animal feed do not conflict with human food security interests, the use of leaf meal as a possible fish meal substitute to reduce the cost of fish feed is receiving increasing attention by fish nutritionists around the world (Bairagi et. al., 2004). This study has demonstrated that the leaves of LLM can be included in the diet of African catfish without compromising growth performances of the African catfish. The major challenge limiting the use of alternative food sources of plant origin is it’s acceptability by the fish, and this frequently relates to the palatability of the diet (Rodriguez et. al., 1996). Lower growth response of Oreochromis niloticus fed higher levels of cassava peels were reported by Oresegun and Alegbeleye (2001). However, all the experimental diets were accepted by Clarias gariepinus fingerlings in this study, indicating that the levels of incorporation of Leucaena leaf meal did not affect the palatability of the diets, instead there was observed significant increase in growth as the inclusions levels increases. This could be due to the processing technique applied which involved soaking and drying the leave hence reducing the antinutrient in Leucaena leaf meal which is mainly mimosine. This observation is in line with the works Siddhuraju and Becker (2003), Francis et. al., (2001) and Fagbenro (1999) who reported that incorporation of processed leaf meals in the diet of fish will not reduce palatability of the diets hence capable of supporting growth performance of fish. The result of Russel., et al (1983) is at variance to the present finding as decreased growth rate was observed with the inclusions of Corn soyabeans meal, observed decrease was said to have resulted due to reduction in the level of protein and essential amino acids in the diet containing higher substitution level of leaf meal replacing fish meal. Nutritional trials on tilapia revealed that 1pil-1pil, Leucaena leucocephala leaf meal in the diets at 12.5% inclusion did not affect growth, however, at high levels of inclusion, 25% or more, the growth of O. niloticus was adversely affected, however, other various studies on Tilapia fishes have shown that leaf meal protein at low levels of inclusion (less than 50%) in fish diets are able to support growth (Ritcher et. al., 2003; Santiago et. al., 1988; Afuang et.al., 2003), the plant sources, anti-nutritional factor, processing methods, etc. may have been the reason for the observed differences in these reported studies. The growth performances of the fish (shown in Table 3) agree with those of the early works of Ritcher et.al., (2003). Nutritional trials by Sotolu (2010) on Clarias gariepinus fed Leucaena leucocephala seed meal reveal that inclusions beyond 4.88 adversely reduce growth of the fish, the observed difference between the present study and that of Sotolu (2010) may be due to higher anti-nutritional content of seed compared to leaves which may not be destroyed by mere soaking and drying hence consistent increase of the Leucaena leucocephala seed meal in the diet increased the anti-nutritional content of the diet and hence retarded growth significantly (Jones 1979; and Tangendijaja et al., 1990). All fish fed the experimental diets produced higher values of fish carcass protein and lipid than initial values, yet there existed significant difference among them indicating different utilization levels of the diets. These significantly high values of crude protein is in line with the reported work of Alegbeleye et al. (2001) on the effective utilization of bambara groundnut at varying levels by Heteroclarias. Mortality are good indicators of the suitability of the diet and environment where fish are cultured, hence the high survival of fish observed in this study are probably due to the suitability of LLM in the diet of Clarias gariepinus, good handling and good water quality management. The leaves of Leucaena leucocephala have the potential to make considerable contributions to feeding of the Africa catfish as this study demonstrate the it’s suitability at 20% level of inclusion without any negative effects on the growth. Leucaena leaves are locally abundant in the tropics and can be obtained throughout the year. The authors wish to thank the authority of the Federal University of Agriculture Makurdi, Nigeria in whose facility this research was carried out, we are also grateful to the technical staffs of the Department of Fisheries and Aquaculture who helped in logistics and data collection. Adikwu, O.A., (1992). Fish Feed and Nutrition. A paper presentation at the FISON symposium held at Sokoto on 31st October 1991, organized by African Regional Aquaculture Centre and N.I.O.M.R. P/Harcourt. Afuang, W., Siddhurju, P and Becker, K., (2003). Comparative nutritional evaluation of raw, methanol extracted residues and methanol extracts of Moringa (Moringaoleifera Lam.) leaves on growth performance and feed utilization in Nile Tilapia (Oreochromisniloticus L.). Aquaculture Research Vol. 34: 1147-1159. Alegbeleye W.O., Oresegun A.O. and Omitoyin O., (2001), Use of Bambara groundnut (Vigna subterranean) meal in the diets of Heteroclarias fingerlings. Moor J. Agric. Res. 2: 54-59. Amisah, S., Oteng, M.A and Ofuri, J.K., (2009). Growth Performance of the African catfish, Clariasgariepinus fed varying inclusion levels of Leucaenaleucephala, leaf meal. Journal of Applied Science and Environmental Management, 113: 21-26. AOAC. (2000). Official Methods for Analysis (14th edition). 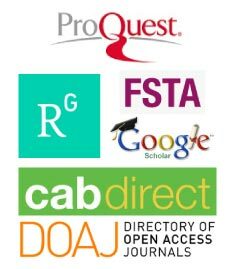 Association of Official Analytical Chemists. Arlington VA. USA. Atawodi, SE., Mari, D., Atawodi, J.C. and Yahaya, Y., (2008). Assessment of Leucaenaleucocephala leaves as feed supplement in laying hens. African Journal of Biotechnology, 7(3): 317-321. Bairagi, A., Sarkar Ghosh, K.S, and Ray, A.K., (2004). Evaluation of the nutritive value of Leucaenaleucocephala leaf meal, inoculated with fish intestinal bacteria Bacillus subtilis and Bacillus circulans in formulated diets for rohu, Labeorohita (Hamilton) fingerlings. Aquaculture Research, 35: 436-446. Fagbenro, O.A., (1999). Comparative evaluation of heatprocessed winged bean (Psophocarpustetragonolobus) Committee on Animal Nutrition (CAN), (Pantastico and Baldia, 1980; As. J. Food Ag-Ind, 2009, Special Issue, S137-S144 Vogt et al., 1986). 1993. Nutrient Requirements of Fish National Research Council. Francis, G., Makkar, H.P.S and Becker, K., (2001). Antinutritional factors present in plant-derived alternate fish feed ingredients and their effects in fish. Aquaculture, 199: 197-227. Gabriel, U. U., Obomanu, F.G and Edori, O.S., (2007). Digestibility and Nutritional Values of Differently processed Leucaenaleucocephala (Lam De Wit) Seed Meals in the Diet of African Catfish (Clariasgariepinus). Middle-East J. Sci. Res, 3(4): 190-199. Jones R.J., (1979). The value of Leucaenaleucocephala as a feed for ruminants in the tropics. World Anim, Rev, 31, 13-23. Oresegun, A and Alegbeleye W.O., (2001). Growth response and nutrient utilization of Tilapia (Oreochromisniloticus) fed varying dietary levels of cassava peels based on rations supplemented with the dl-methionine. Fish nutrition and fish feed Technology in Nigeria Edt: I: 38-44. Ritcher, N., Siddhuraju, A and Becker, K., (2003). Evaluation of nutritional quality of moringa (Moringaoleifera Lam.) leaves as alternative protein source for Tilapia (Oreochromisniloticus L.). Aquaculture, 217: 599-611. Rodriguez, SM., Olvera, N.M.A and Carmona, O.C., (1996). Nutritional value of animal by product meal in practical diets for Nile Tilapia, Oreochromisniloticus (L) fry. Aquaculture Res, 27: 67-73. Russel, L.E., Cromwell, G.L and Stahly, T.S., (1983). Tryptophan, Threonine, Isoleucine and Methionine supplementation of Corn-Soybean meal diet for growing pigs. J. Animal Sci, 56: 1115-1123. Santiago, C.B., Aldaba, M.B., Laron, M.A and Reyes, O.S., (1988). Reproductive performances and growth of Nile Tilapia (Oreochromisniloticus) brood stock fed diets containing Leucaenaleucocephala leaf meal. Aquaculture, 70: 53-61. Siddhuraju, P and Becker, K., (2003). Comparative nutritional evaluation of differentially processed mucuna seeds (Mucunapruriens (L.) DC var. utilis (Wall ex Wight) Baker ex Burck, on growth performance, feed utilization and body composition in Nile Tilapia (Oreochromisniloticus L.), Aquaculture, 34: 487-500. Sotolu A.O. (2010) Growth Performance of Clariasgariepinus (Burchell, 1822) Fed Varying Inclusions of Leucaenaleucocephala Seed Meal, Tropicultura, 28 (3): 168-172. Tangendijaja, B., Raharjo Y.C and Lowry J.B, (1990). Leucaena leaf meal in the diet of growing rabbits: evaluation and effect of a low mimosine treatment. Animal Feed Science and Technology, 29, 63-72. Tiamiyu, L. O., Okomoda, V.T and Iber, B, (2013). Growth response of Clariasgariepinus fingerlings fed diet substituted groundnut cake meal and cotton seed meal. Livestock Research for Rural Development. 25: Article #76.